We had a bit of good happen today that caused quite a stir here on the homestead. Though our hens have stopped laying (again!) with the bad weather and cold- I attribute this lack to that cause since nothing else in their world has changed- Sean still checks their nest boxes each day with hope. 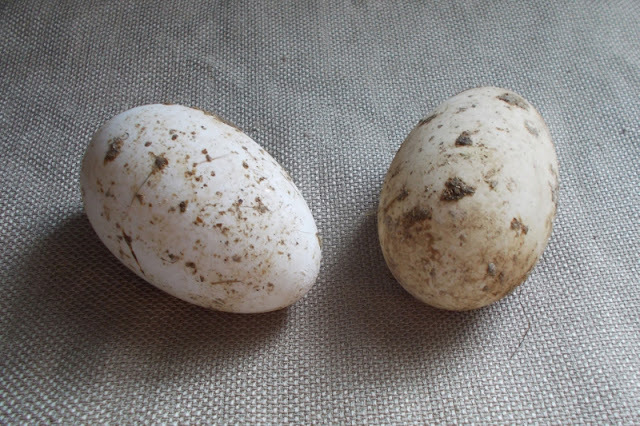 Today, he came in with a HUGE grin on his face and 2 geese eggs in his hands; these from the small duck house. The first of their kind to be laid. I had heard that goose eggs are large in size, but having never seen one before, I had no idea what to expect. I am still in the process of researching whether or not the size of the goose eggs layed increases as the goose matures, like in hens. If any of you have information regarding this, I would be very interested in hearing from you about it. Regardless, I decided to record the weight of the eggs collected from our hens to compare to the goose eggs. Our pullets lay smaller eggs and these weighed approximately 1.5 oz. 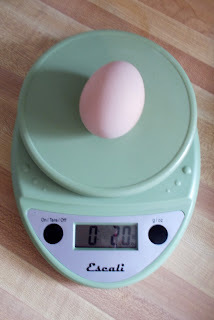 Our mature laying hens' eggs weighed in around 2 oz each. 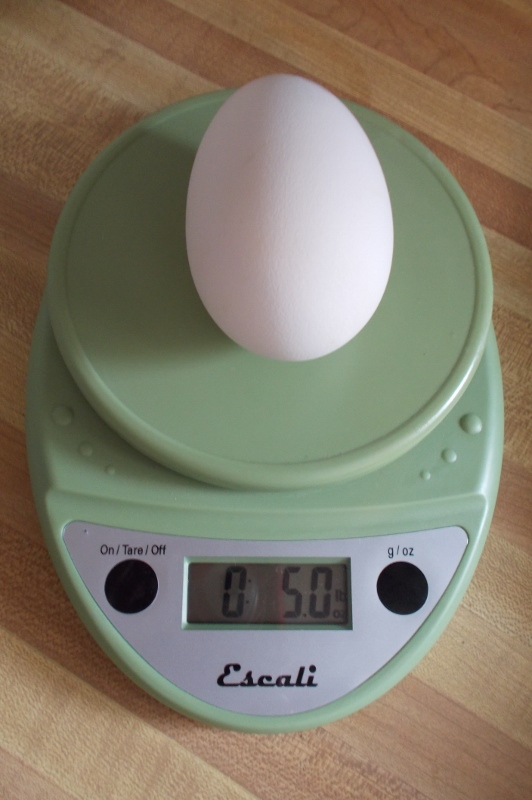 Today's goose egg measured a whopping 5 oz! 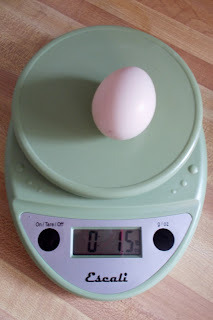 Basically, one goose egg equals 2.5 regular hen eggs. Neither Sean nor I have eaten geese eggs before. We are excited to try them out this weekend. I don't think that I will fry them, but I see either some scrambled eggs or omelets for breakfast Saturday morning. We'll be sure to write a review about their taste and share it with you. Tomorrow, our vet is coming to check the does. I worry about everything- All... The... Time... So, while I am glad she is coming out, I am very anxious about what she might find. Sean has been busy reassuring me that our does are all behaving like normal, healthy goats and that we have nothing to worry about. Sean kindly and firmly reminded me how good it will feel to have some conclusive idea about who really is pregnant (and not just waxing fat) and confirm potential due dates. Maybe, we'll even hear fetal heart-beats. That would be amazing. It is just hard to be comfortable in light of recent events. I know that I am over-reacting; I just don't seem capable of stopping it. I hope this visit will help to bring our life back into some semblance of normal- or at least, what passes for that around here. Thanks for stopping in for a visit tonight, friends. We're glad you came. 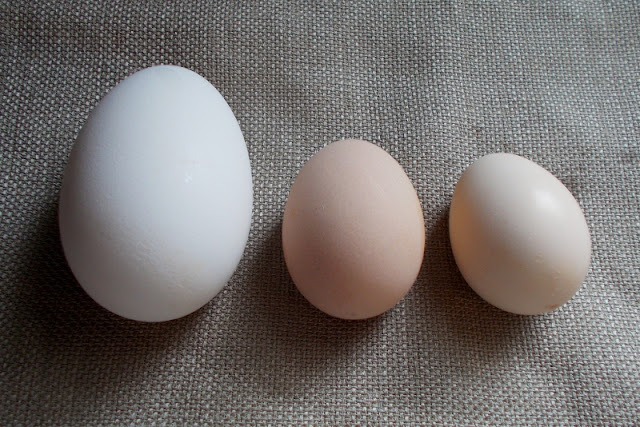 You have had goose eggs in your childhood. I love those goose eggs!! Not that I should eat cake, but I bet just one of those would make a nice pound cake. Let me know how they taste after Saturday breakfast. So glad for some good stuff happening! I hope your vet visit goes good and everyone is healthy. Enjoy the special breakfast! Woah, that is a big egg! Congrats! I bet it was so exciting to find that. Can't wait to hear how it tastes. Good luck with the vet. I hope the visit will help you to feel a bit better about the health of your does.